Someone said this one should be called ’the ABSLSC reaches new heights’. Geoff Searl has shared a few photos of his ‘walks’ during past years, one memorable one being the 84 kilometres South Coast Track trek through Tasmania that was followed by an even more challenging in Western Australia. This week he and his intrepid walking companion, cousin David Searl, have completed a great springtime celebration of one of our more glorious National Parks. We pleaded with Geoff to share some photos on his return and not only has he done justice to the beauty of this place, he also, ever the mindful and passionate Historian, captured some images of what was seen along the way that has a local connection in one particular instance. 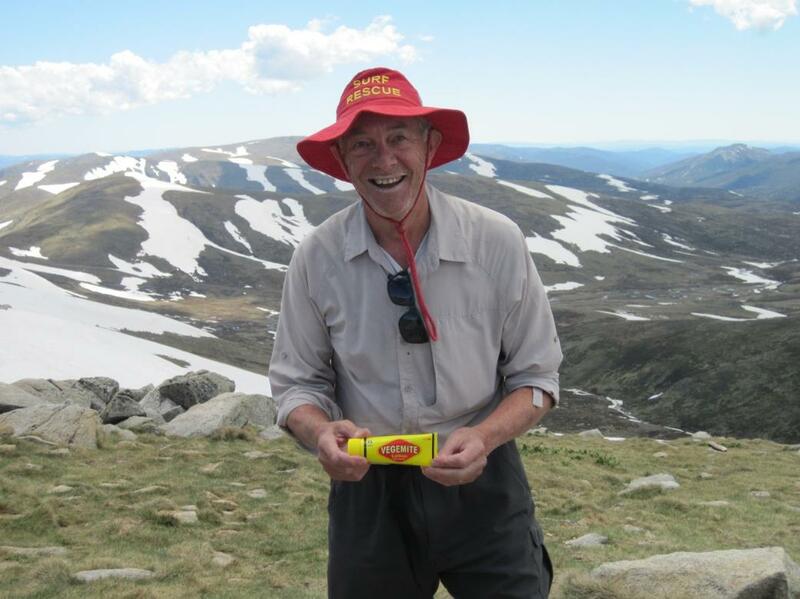 The challenging Main Range walk takes in glacial lakes, historic huts, and the summit of Mount Kosciuszko, across alpine high country in Kosciuszko National Park. The walk is snowbound in winter, between June and October, so it’s one for Spring or Summer. Walkers set out from Charlotte's Pass which takes you through the glacier-carved landscapes of this protected UNESCO Biosphere Reserve. Walkers cross the fabled Snowy River, journey past Hedley Tarn and Blue Lake, and can be dazzled by wildflower meadows in early summer. Then it's high up along the rugged Main Range to the very rooftop of Australia, Mount Kosciuszko (2228m), where the views across the Australian Alps stretch as far as the eye can see. From here, the track loops back to Charlotte's Pass via the Mount Kosciuszko Summit trail. If you're well-equipped, and prepared for an overnight back country camping, the walk can be spread over a couple of days. "Wow, what a trip and what a place and what a remarkable country we live in! We walked 30 ks in 2 days on the Main Range of the mountains. Day 1 we walked 12 ks out to Carruthers Peak via the Blue Lake and Day 2 18ks to summit Kozzie from Charlotte Pass! As you can see the weather Mother Nature provided for us was nothing short of stunning, especially considering what we carried in the packs ‘just in case’! A light dusting of the white stuff simply added to the spectacle, visually and photographically. The water from the headwaters of the Snowy River was so special and clean it has almost topped the taste of my favourite Sav. Blanc from NZ!! Back a day earlier with thunderstorms forecast - we didn’t need them, it’s called calculated hiking! Some looney cooling off after the 450 metre ascent of Carruthers Peak! Called the Windswept Feldmark Buttercups - 15 to 20 mms across and so exquisite and rare. One of the original mile posts (2 miles) from Kozzie on the Summit Track with Seaman’s Hut in the distance. I actually called Laurie from the hut to let him know I was there and that the hut was being dutifully maintained and replenished with firewood just in case it’s necessary. Also, inside the hut is a memorial plaque to the four young snowboarders who were tragically lost in 1999 when the snow cave they had built collapsed – they were only 1.5k’s southwest of Seaman’s Hut – if only they’d made that extra kilometre and a half they would have been safe. Not sure why so many of these snow gums were looking so poor - fire or dieback? The summit of Kozzie ahead and up in the middle of the pic. 2228 metres and there ain’t no more! Seaman's Hut is an alpine hut and memorial. It was built following the death of two skiers, William Laurie Seaman and Evan Hayes in 1928. Laurie's family built the hut to provide shelter to future users of the park, in order to prevent recurrence of a similar tragedy. Seaman's hut is constructed from rock and has two rooms and a foyer for firewood storage. The floor is plank flooring.